The idea of building houses using massive 3D printers is nothing new…but it hasn’t moved beyond the idea stage…until now. In China, the WinSun Decoration Design Engineering company has developed a machine to print ten sample structures, each about 200 square meters in size (they didn’t invent the machine, but are the first to really do something on this scale). The printer extrudes a concrete-like material to build up the walls layer by layer; printing the sloped roof is possible if the house is done in slices that are then rotated up into position (or you can print the walls in their normal orientation, and add a roof using other construction methods). The video below shows the process well. I’d be curious in seeing an environmental comparison of this process versus traditional wood frame houses – concrete is not eco-friendly, but it does have the potential to last much longer. Who would have thought…a 3D printer that uses yarn? It uses a needle to piece and entangle the newly placed yarn with the material below, so you end up with more of a ‘lump’ than woven fabric. But, pretty cool stuff. Check out the video below to see it in action. Graphene, a one-atom thick sheet of carbon atoms, is truly a ‘super material’, though one that’s still mostly existing only in labs and not everyday life. Yet. American Graphite Technologies is working on extrudable graphene which could then be used in 3D printers to enable new manufacturing possibilities for this fantastic material. Just how good is it? Well it conducts electricity well, conducts head extremely well, and is 200 times stronger than steel. It’s also virtually transparent. Pretty cool stuff, and regardless of whether they pull off this 3D printing, expect this material to become a part of your life soon. There’s a pretty cool 3D scanner project active over on Kickstarter right now. It hits a couple key features as I see it…interfaces to an iPad for portability and ease of use, and is a reasonable cost ($329). I think this will be cool for capturing rough cad data of large objects and I look forward to trying it out with SolidWorks when it ships in 2014. Not surprisingly, people are freaking out about the 3D Printed Gun design that was released a few days ago. The US State Department sent a cease and desist letter to the person who posted the plans online, demanding that they be removed. He complied (though has hired a lawyer to fight this), but to even make such a request shows incredible ignorance of the information age we live in. The plans were downloaded around one million times and are available elsewhere online. Governments cannot suppress information…to attempt to do so is futile. Lawmakers in California and other areas of the country are trying to ban 3D printed gun technology. Meanwhile, efforts to implement mandatory background checks for gun purchases have failed in Congress. So, you can’t print your own single-shot gun that might explode in your hands when you try to use it and at has horrible accuracy, but it’s OK to go buy an AR-15 with high capacity magazine, armor piecing rounds, and body armor. Does anyone else see the lunacy in this? With all the advances in 3D printing, it was inevitable that someone, someday, would create a 3D printed gun…and that day is here. The only non-plastic parts are the firing pin, and the bullet. Everything else is plastic, printed on a Stratasys Dimension SST 3D printer in ABS…a step above the hobbyist grade 3D printers like the Cube. As far as firearms go, this one is pretty crude – it’s a single shot device which must be manually loaded, and a test with a larger caliber bullet resulted in destruction of the gun (the successful test used a .380 caliber round). So, this is very much an immature product, but represents a huge milestone for the technology. There are those who believe that our species can create amazing technology and regulate it to the point where it is safe for society, but the reality is that technology can be used for both good and bad, and attempts to regulate that are eventually futile. If you want to download the models yourself, head to DefCAD. I wouldn’t recommend it though…this is a marginal design and really more of a proof of concept…be careful. Note that in the test firings, a string was used to actuate the trigger. All this 3D printing has reminded me of perhaps my favorite music video of all time…Computer Assisted Design by They Might Be Giants. It’s really a combination of Computer Assisted Design and Computer Assisted Manufacturing…but hey, for the target audience (younger than me! ), it’s great. One more thing – PLA plastic, one of the options for use in my 3D printer, is compostable! I’ve been really enjoying my Cube printer, but it has not been without its learning curve. Like any part design, you need to design the part with the manufacturing process in mind, and I’m learning quite a bit about extruded filament part production. One issue is that large parts with thick sections tend to warp. The Cube software provides an option for a raft – basically a lattice of thin lines laid down first, providing a stable bed upon which to build the part – but this greatly increases the post-processing time. Namely, you need to scrape or sand off the raft. It’s not a huge deal but does waste material and time. Consider the bracket design shown above. It’s simple enough, with a uniform cross section and was designed to be printable without needing supports (thin webs of material to support overhangs and such). However, when printing, this part would warp and curl, forcing me to abort the print. As I learn more, I’m just not seeing how this technology is ready for mainstream home use like some articles seem to suggest. You need to be a tinkerer and know your way around CAD to get parts that are really going to do what you want. For that type of person though, this printer is fantastic! 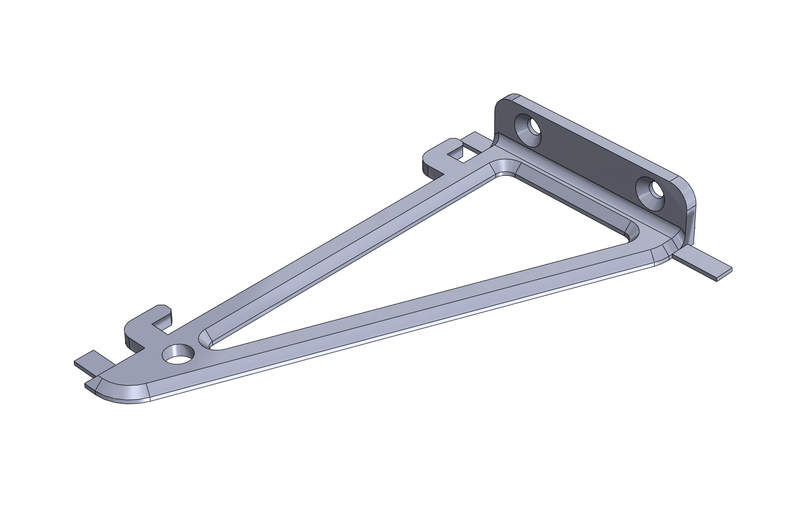 I’ve been able to iterate prototype parts much quicker than before and am producing better designs, faster. 3D printing is taking a big step forward with the Gigabot, a Kickstarter project that aims to produce a 3D printer with a massive 24x24x24″ build envelope! Ready-to-assemble kits cost $2500 (pay more if you want it assembled for you). Cool stuff, though I’m not quite sure the market is ready for this (apart from those people wishing to print cool lamp shades…).